The Union Home Minister Shri Rajnath Singh inaugurated the 1st National Conference of Investigating Agencies here today. The two day conference is being organized by BPR & D in coordination with NIA. 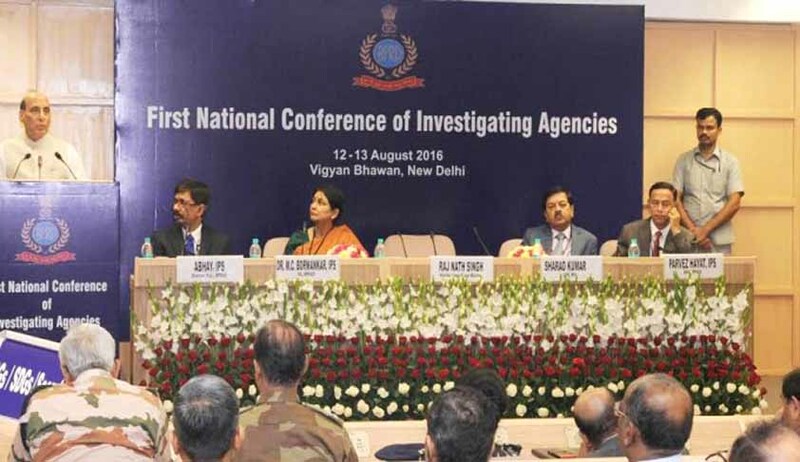 Inaugurating the conference earlier the day, Shri Rajnath Singh said that investigation agencies are facing many challenges in the investigation of traditional and modern crimes. He said that this conference is an opportunity to discuss these challenges and ways to overcome them. He expressed hope that this conference will discuss ways to improve quality of investigation especially for economic and organized crimes and related legal issues. The conference was attended by more than 100 delegates from States/ UTs/ CPOs who are working in investigation agencies such as Crime branches/ EOW/ STF/ etc. A large number of police officers from the CPOs/CAPFs and other important investigating agencies like ED/ CBI/ SFIO/ FIU etc. also attended the conference. Three sessions were held on the first day of the conference today. The first session was held on “Combating Economic and Organized Crime”. During the session, Shri Karnal Singh, Director, Enforcement Directorate spoke on Coordination between ED and other Investigating Agencies. Shri Pankaj Kumar Mishra, Director, FIU spoke on “Role/ Functions of FIU and Coordination of FIU with Investigation Agencies” and Shri Rajeev Rai Bhatnagar, DG, NCB spoke on “Indian Drug Enforcement Regime and Role of Investigation Agencies”. The second sessions was held on “Digital & Technology Driven Crimes”. Dr. Arvind Gupta, Deputy NSA was the Chairman of the session and delivered the key note address. During this session, Shri Gulshan Rai, National Cyber Security Coordinator spoke on “Responding to Cyber Crime- the strategic responses”. Shri M.M. Oberoi, Director Interpol spoke on “Combating Cyber Crime- Learning from International Experience” and Shri Muktesh Chander, DG, Goa spoke on “Cybercrime and cyber threats to internal security”. The third session was held on Ideas from States. Shri Pankaj Kumar Singh, ADG, CID CB, Rajasthan spoke on “Cutting edge technologies and their application to investigation”. Shri M.A. Ganapathy, DGP, Uttaranchal spoke on “Database and Crime Investigation”. Shri Shatrujeet Kapur, ADG (Crime), Haryana spoke on “Challenges in Implementation of JJ Act” and Shri CDT Rao spoke on “Crime data analytics system”. All the participant delegates as well as observers participated actively in very lively discussions that followed the presentation by eminent speakers. On the second day of the conference tomorrow, sessions on the themes legal Issues relating to Investigation and “Terrorist Crime Investigation: NIA Experience” will be held. Justice Dr Balbir Singh Chauhan, Chairman of the 21st Law Commission of India will chair the session on “Legal issues faced by Delhi Police and deliver the Keynote address. The valedictory address for the conference will be delivered by Justice Supreme Court of India, Shri U U Lalit tomorrow.